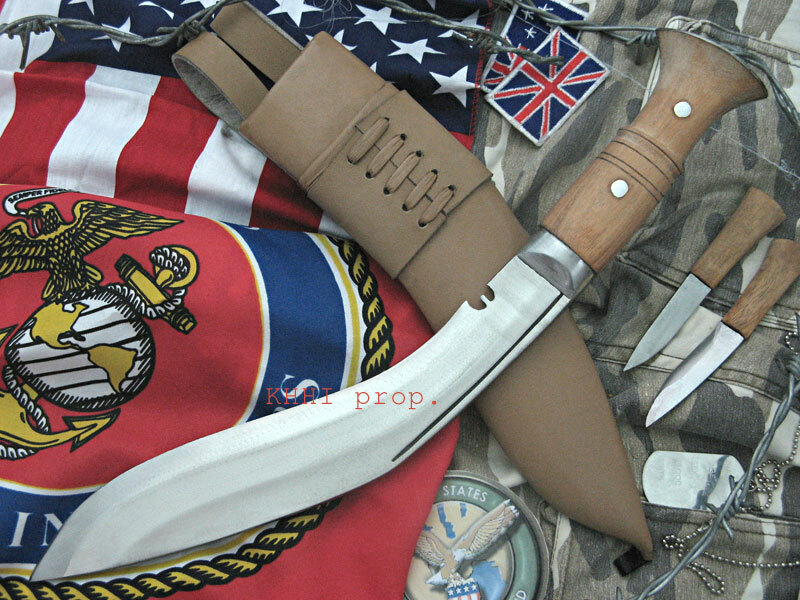 A special and lethal kukri made by KHHI designated for the soldiers serving in Iraq..
Operation Iraqi Freedom Khukuri (OIFK) is a special and unique khukuri (knife) made by KHHI designated for the soldiers serving in Iraq. It is obviously not an issued knife but can be carried by interested soldiers. It is especially created to be a part of the warfare kit carried by the troops of the coalition force. 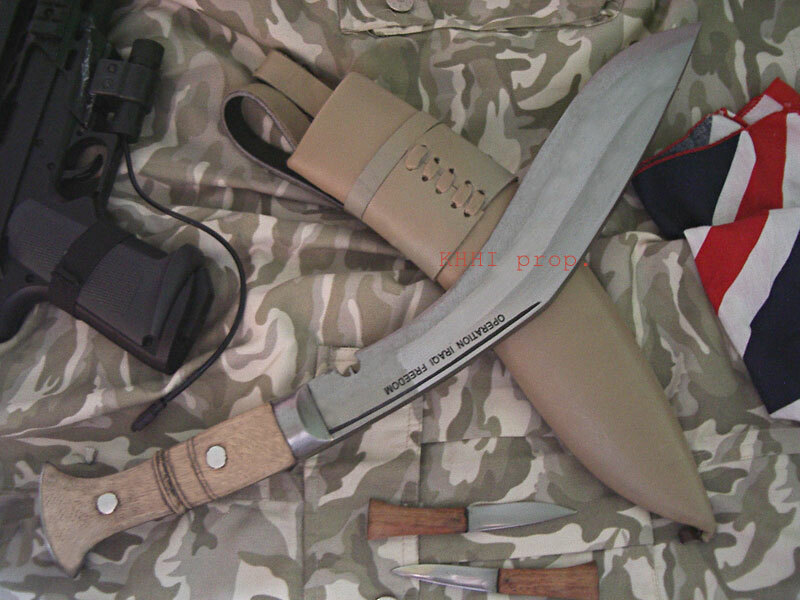 A belief in Nepalese culture as “Kukri” being the protector because of its religious and practical values may possibly play a role in encouraging or stabilizing the minds and mission of the soldiers in the front line. This kukri blade is basically the “World War” version issued to the Gurkhas during world war days however, with an improvised finishing. Unlike its siblings, the blade is semi-polished and has a fuller or chirra from tip to the notch area on its surface level/panel. It is designed so to give more strength and durability to the width of the blade while in use and at the same time cuts down the unnecessarily weight of blade as in the I-beams concept. The curvature will also give much needed support to the flat surface for heavy duty work as it absorbs the direct impact felt by the edge of the blade. It is a display of true craftsmanship as it is the hardest to craft. The unpolished blade also skips the long machinery process of getting polished and as a result the temper stays on resulting into stronger edge/bevel and additional sharpness. The handle of this kukri is made like that of the famous “Panawal” version where the full flat tang goes all the way through the handle and aluminum rivets are fitted to strengthen the whole fixture. The metal tang can also be clearly seen at the two sides of the handle. Both, bolster and pommel are also made in iron to give strength and better look. An extra effort is put to make the handle from white Indian rosewood to match the scabbard and uniforms of the troops. Similarly, the scabbard of this knife is also made in cream (Off White) color leather to match the uniform of the soldiers involved in the mission. The color gives a perfect camouflage to dodge the eyes of enemies. This type of scabbard is durable and displayable as well. The kukri has engraving in one side of the blade; “OIFK" to dedicate this special unique knife to the cause and mission of the war. Hi , i have recieved my Kukri today and i am very pleased with it . Well packaged and no damage and delivered very quickly . Bought one in 2012 as a present for a friend and he swears by it. It stands up to heavy chopping tasks and maintains a good edge despite heavy abuse.